We have an excellent reputation for both the academic results and the personal development and care of our young people. We offer a diversity of courses and opportunities that enable many students to move to the next stage of their education or the world of work as knowledgeable, skilled and confident individuals. Our vision is to use the power of education to improve lives and the world. A National Teaching School, with excellent facilities, committed staff and a supportive community, we work hard towards this. Commitment and desire to learn and achieve by both students and teachers, are two essential criteria for academic success. All our post-16 teachers are experts in their subject area. We are especially proud of the contribution that our Sixth Form students make to school life. Choosing the right school for your child’s secondary education is a very important decision. 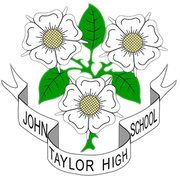 Therefore, we encourage you to visit John Taylor High School so that you can experience the special atmosphere which exists as children and staff work and learn together. To arrange a visit, please contact the school. The Head of School or a senior member of staff will be pleased to show you around and answer any questions you may have. We look forward to welcoming you to John Taylor!